The great thing about soups is that they’re hot, salty, filling, but they always make me feel like I’m staying healthy. This particular soup is not the healthiest one I’ve ever made, due to the cheese and half-and-half, but relatively speaking there are much worse things I can eat… or so I tell myself. This soup does fill you up though! I was full after about one bowl, so calorie wise you’re eating a lot less if you have soup for dinner instead of something else (like pizza). Like I said earlier, I wanted to experiment with this soup; partially because I want to play with my dishes more instead of following recipes, but mostly because Matt was literally being impossible and not giving me any freaking ideas about what he wanted for dinner. 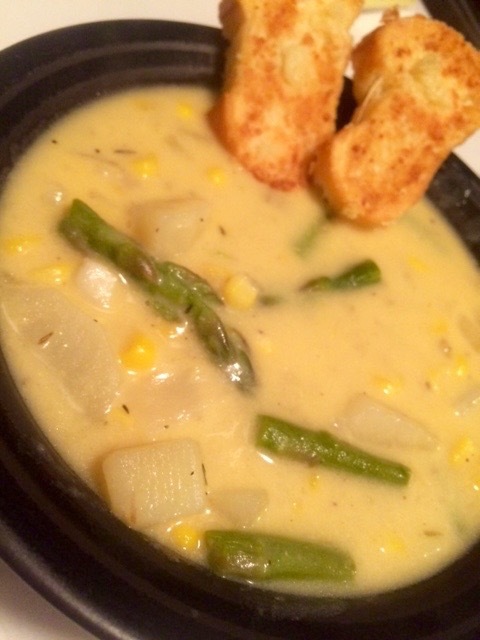 So I decided on a chowder with two of my favorite veggies: corn and asparagus! Honestly if you don’t like corn or asparagus then I don’t trust you as a person. And what makes corn and asparagus even better? CHEEEEEESE!!!!! 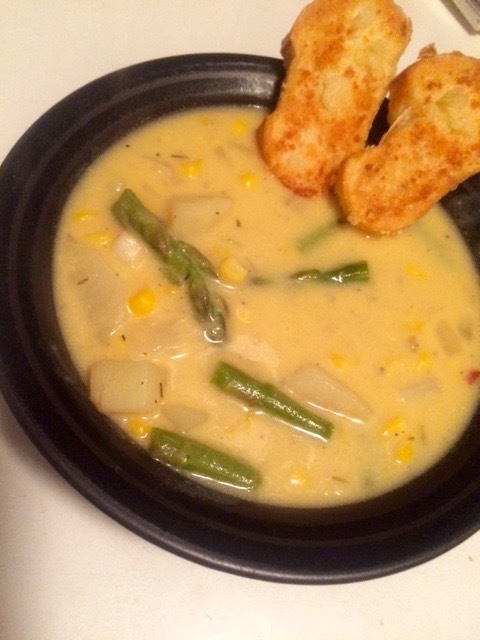 So there you have it, a delicious chowder with potatoes, corn, asparagus, and cheddar. What I love most about the chowders I make is the creamy broth. I don’t know why, but all the chowders I make have a similar flavor, minus the individual flavor of whatever veggies I choose. I guess it’s because I’ve found a few staple spices that I always include: salt, pepper, red pepper flakes, thyme, and a bay leaf. If you use those spices you’ll never go wrong with a soup! I’ve found what I like and I’ve stuck to it, but certainly I like to experiment with spices and herbs depending on the type of soup I’ve made. But for chowders, thyme is a must. And salt and pepper but that’s a no brainer. And as a side note, I cook with a lot of salt so feel free to cut some out of my recipes if you’d like, I won’t be offended. Heat olive oil over medium high heat in a large stock pot until hot. Add chopped onion and garlic and sauté for about 5 minutes. Add asparagus spears, salt, pepper, red pepper flakes, and thyme, and saute another 2 minutes until onions are translucent and asparagus is bright green. Add the flour and mix until the vegetables are completely covered. Cook another two minutes, and add the vegetable stock, potatoes, and the corn. Stir well. Bring to a boil, and then add the cup of half and half and the bay leaf. Reduce heat and simmer for about 20 minutes. About 10 minutes in, add the cup of cheddar cheese and mix will until melted. Continue simmering. While soup is simmering, turn the over broiler on. Slice the Italian bread into thin slices, and place on a foil-lined baking sheet. Melt 2 Tbsp butter in small ramekin with one clove of chopped garlic. 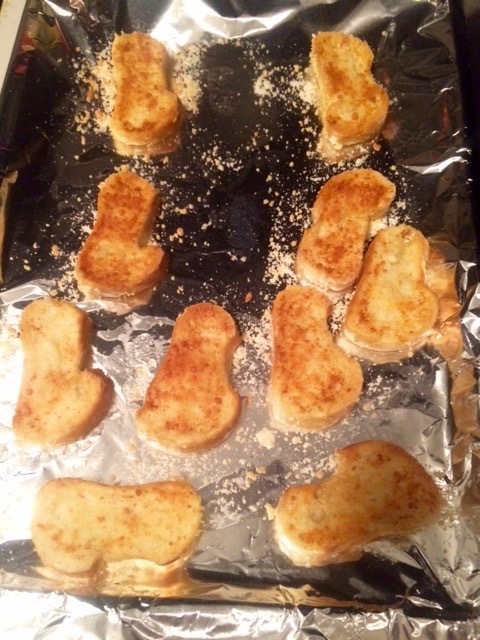 When melted, brush on to sliced pieces of bread. Sprinkle a generous amount of parmesan cheese on top. Put bread into the oven for about 5 minutes until toasted and crispy. Make sure you watch the toast! Broiling times will vary depending on the oven and how close the bread is to the flame. When toasted, remove baking sheet from oven to cool. 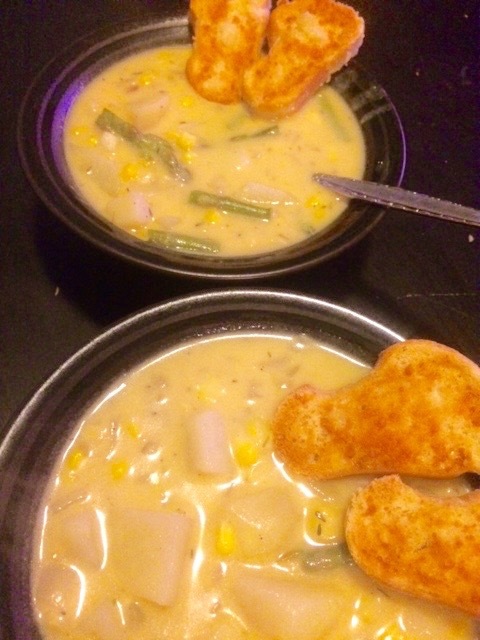 When soup has simmered and potatoes are soft, serve soup into bowls and serve toasts along side of the soup. Let it cool so you don’t burn your mouth 🙂 And enjoy!